​CALL US TO GET YOUR FREE ESTIMATE! If you are looking to install a somewhat standard window in your home or office in Natick, MA or Boston, MA area, but are searching for something with a more contemporary feel than the traditional double hung window, sliding windows may be the best option for you! Natick Window Company offers a large selection of these sliding (otherwise called “gliding”) windows to choose from. Sliding windows open horizontally, and glide open on a track, unlike their traditional counterpart would happens to be the double hung window. Sliding windows provide a great aesthetic and can fit seamlessly into the design of any room in your home or office. These windows also provide that contemporary feel that can help to freshen up a newly renovated space, or any room that you are looking to make some changes to. There are many great benefits to installing sliding windows in your home or office. Of course, as to be considered with any window style, sliding windows are an ideal energy efficient choice. Natick Window Company is once again proud to offer a great selection of energy efficient options when it comes to choosing the right sliding window for you, and will help to make sure you get the most out of your product. We offer a wide variety of sliding window options that will help to reduce any air infiltration as well as keeping the elements out of your home. Sliding windows are also very easy to open, making them an ideal choice if your windows are located in hard to reach areas of any room in your home. 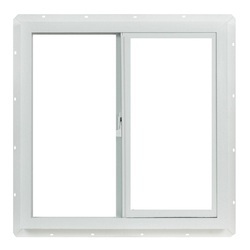 Usually made from aluminum, sliding windows are lightweight which also helps them to be easy to open. No more struggling to get the right leverage just to open a window. With an easy-open closure system, sliding windows are a common choice by many homeowners in Massachusetts. The care and keeping of sliding windows is another benefit to their installation; they are the easiest of any window surface to keep clean! The panel of these windows is easily lifted from the pane to make for easy and thorough cleaning, without the struggle and hassle. In addition to installation of new sliding windows, Natick Window Company is the best place to go for replacements and repairs on your existing sliding windows! Our technicians have a great deal of experience working with this style of window, and will make sure that the insulation is intact and you get the optimal performance from your sliding windows. If you are planning on having sliding windows installed or are in need of repairs or replacement sliding windows, Natick Window Company is your local source for all of these services! We will work with you, your budget, and your schedule to make you that you get the windows you want, when you need them, and all at a price you can afford! Call us today at 508-251-8038. We have so many options to choose from, you’re sure to find the perfect sliding window for your home or office!